The Satellite programme of contemporary art exhibitions was started by the Jeu de Paume in 2007. Each programme is conceived by an internationally renowned curator (Fabienne Fulchéri, María Inés Rodríguez, Elena Filipovic, Raimundas Malašauskas, Filipa Oliveira, Mathieu Copeland, Nataša Petrešin-Bachelez and Erin Gleeson). Since 2015, this programme of exhibitions has been organised jointly by the Jeu de Paume and the CAPC musée d’art contemporain de Bordeaux. The film No Shooting Stars by Basim Magdy is built around the personal narrative of an unidentified inhabitant of the ocean space, a territory that lays dormant on the margins of our awareness and does not enter history books. Dream-like scenes drift in dissonance with a narration that has no beginning or end. It unfolds like a poem that is affected by the ocean’s secrets but offers no explanation about who is living under the water’s surface, instead meandering through loops of imagination. The image of who exactly the narrator is slips away as soon as it takes shape, reflecting the logic of the unstable grounds of water space. Magdy’s earlier works have often been humorous reflections marked by a scepticism towards utopian states and an anticipation of dystopian outcomes. No Shooting Stars inversely reveals a sense of astonishment at the unknown. 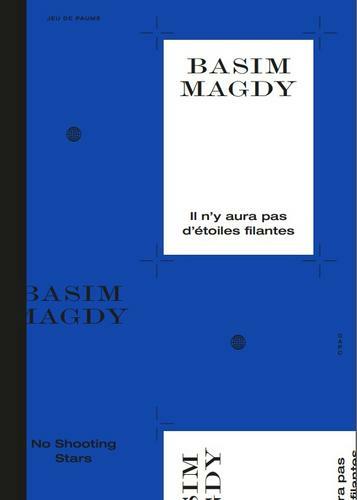 Adopting a perspective of awe, Magdy recognises our ignorance of, and inability to apprehend, the open seas, a space that operates according to its own logic, another system of knowledge that is different from the one we apply. Subsequently, he abandons the quest to capture the intrinsic nature of the water territories and the film becomes a meditation on the glimpses of its mystery. This book explores the ideas emanating from this work through an interview with the artist by Heidi Ballet. Resonating with Basim Magdy’s project, a text by Kate Sutton recounts the mysteries of water and the Palmyra atoll in the Pacific Ocean. Heidi Ballet is a Belgian independent curator and researcher based in Berlin. She is the co-curator of the upcoming 2017 Lofoten International Art Festival together with Milena Hoegsberg. In 2016 she curated the group exhibition “The Morality Reflex” at Contemporary Art Centre (CAC) in Vilnius, and between 2013 and 2015 she worked as a research curator for the exhibition “After Year Zero”, presented at the Haus der Kulturen der Welt in 2013 and the Museum of Modern Art in Warsaw in 2015. Ballet was the assistant curator of the 2012 Taipei Biennial “Modern Monsters / Death and Life of Fiction”, and between 2008 and 2012 worked as gallery director at Jan Mot in Brussels, where she organised the group exhibition “The Encounter” in 2011. In 2014 she participated in the Ricard Corporate Foundation’s “Young Curators Invitational” programme.